On 27th August 2010 DocBook version 5.1b2 and DocBook-XSL version 1.76.0 was released. 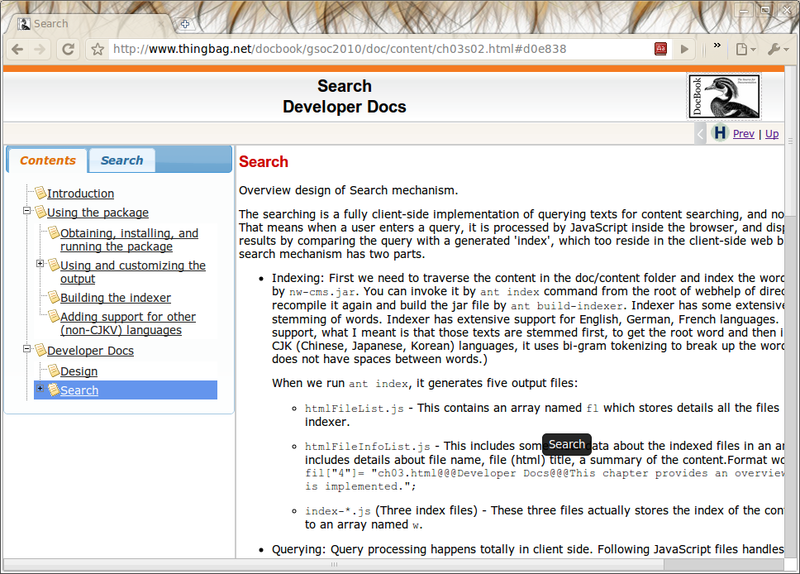 DocBook V5.1b2 is the second test release of DocBook V5.1. Version 5.1b2 is available in RELAX NG and non-normatively in DTD and W3C XML Schema formats. The largest change is the introduction of support for topic-based authoring through the addition of the topic element and the assembly structure. For more information about assemblies, see DocBook Assemblies. RFE 2907124 Allow personal name components directly in bibliomset. Gentext: Many updates and additions to translation/locales thanks to Red Hat, the Fedora Project, and other contributors. Common: Faster localization support, as language files are loaded on demand. FO: Support for SVG content in imagedata added. HTML: Output improved when using 'make.clean.html' and a stock CSS file is now provided. The demo of the output produced by WebHelp XSL customization is available on following link. 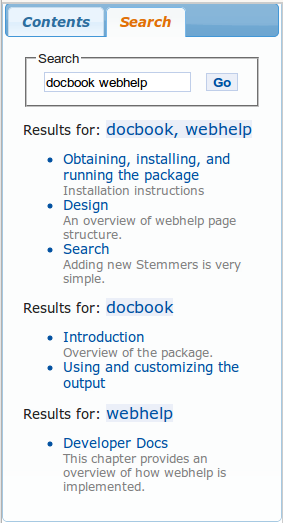 The demo shown is the documentation of DocBook WebHelp. The Webhelp customization is available under, docbook-xsl-ns-1.76.1/webhelp. 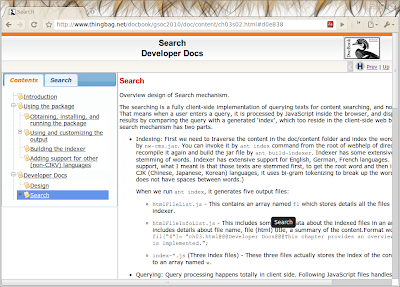 Following is some brief details about the DocBook WebHelp customization. A common requirement for technical publications groups is to produce a Web-based help format that includes a table of contents pane, a search feature, and an index similar to what you get from the Microsoft HTML Help (.chm) format or Eclipse help. If the content is help for a Web application that is not exposed to the Internet or requires that the user be logged in, then it is impossible to use services like Google to add search. 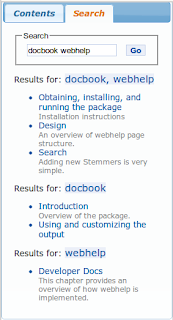 DocBook WebHelp provides a browser-independent, platform-independent documentation “Web Help” output format for DocBook files. WebHelp provides a sophisticated but inexpensive web publishing option for DocBook. Search highlighting shows where the searched for term appears in the results. Use the H button to toggle the highlighting on and off. Table of Contents (TOC) pane with collapsible toc tree. An Ant build.xml file to generate output. You can use this build file by importing it into your own or use it as a model for integrating this output format into your own build system. So, what do you think of the output? Are you interested to give it a try?